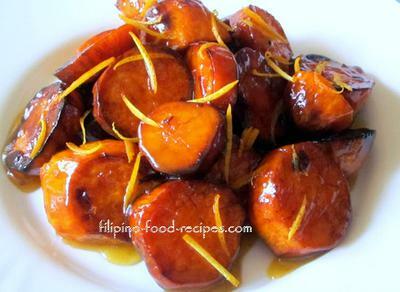 Orange Glazed Yams are kamote or japanese yams with orange flavored caramelized sugar. If you want something more than the usual Kamote-que sold on street corners, try this alternative by putting some orange glaze on it. The yams are cut in serving sizes, about half an inch thick along its length, then fried until cooked through, tossed in a caramelized sugar flavored with orange juice. To give it more 'orangy' flavor, I squeezed one orange fruit to the fried camote before mixing it with the caramelized sugar. I actually first had the orange glaze camote at a restaurant, which was 4 times the price of the street sold Kamote-que -- which, in fact, is merely its dressed-up version. 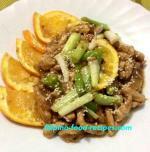 Well, the presentation on the plate with orange zest count for something, too. 1. Peel the yams or Kamote and cut about 1/2 inch thick along its length. 2. Fry until cooked through. 3. Combine the water, orange juice and sugar. 5. Zest 1 orange fruit, then squeeze the juice. 6. Toss the fried yams in the fresh orange juice, then add to the orange caramelized sauce. 7. Toss carefully to coat the yams with the glaze. 8. Set the yams on a serving plate and top with orange zest.